STI/PUB/1352, 107 pp. ; 2 figures; 2018, ISBN 978-92-0-300916-4, Spanish. 32.00 Euro. Date of Issue: 2018-04-05. Full Text, (File Size: 1425 KB). 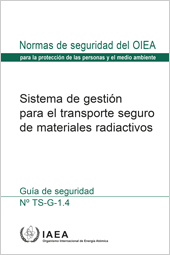 Subject Classification: 0606 - Transport of radioactive material. This publication is also available in English, Russian.